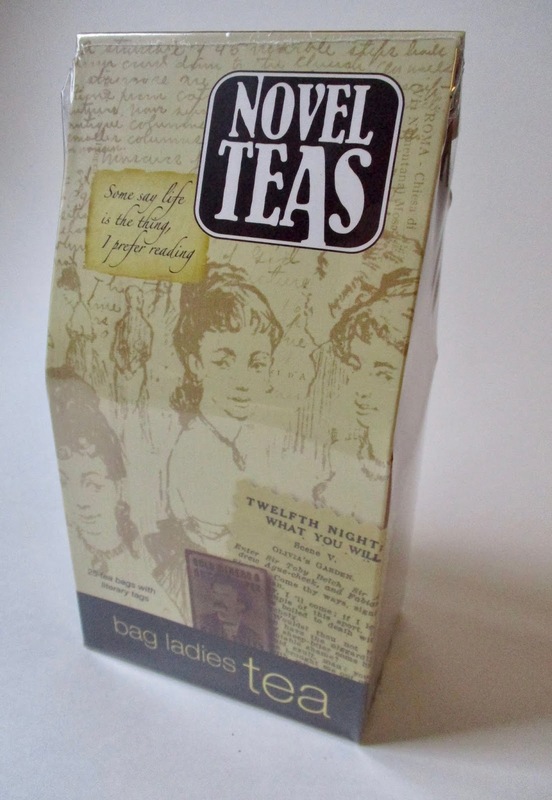 My husband gave a nod to my upcoming novel by giving me the perfect thing to sip: "Novelteas." Ha! He also got me a hard-to-find issue of Daphne's Diary, which I love even more than usual because of the Christmasy tea wares on the cover. 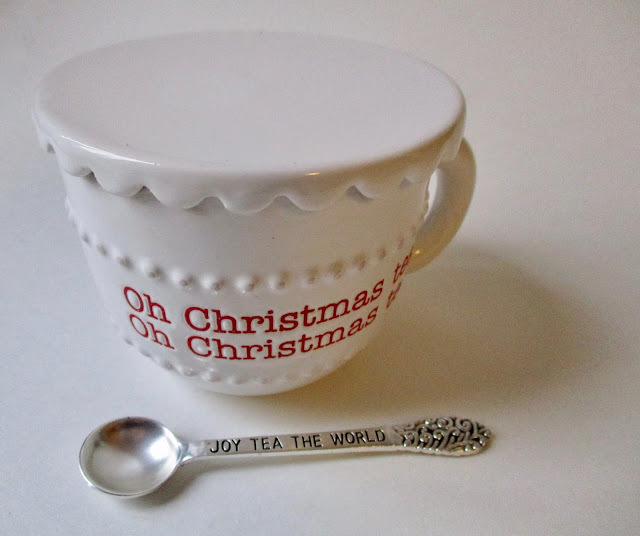 I shared last month how I'd purchased this very "Oh Christmas Tea" teacup design for a friend, and I had wanted to get one for myself but had held off since I had lots of gifts to buy. So I was delighted when a girlfriend gave me one. So glad I didn't purchase it for myself. 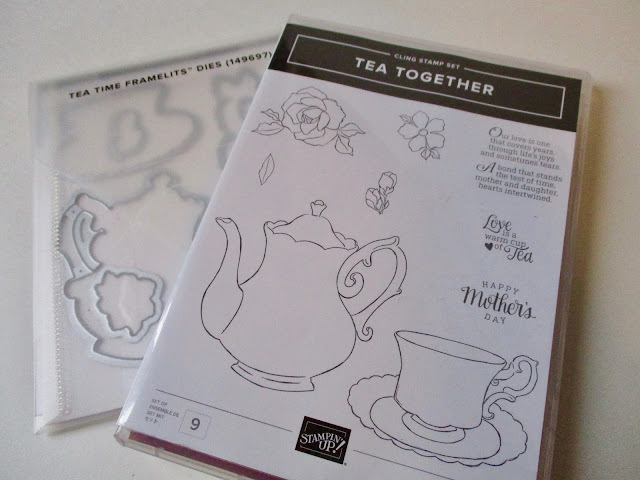 And last but certainly not least, my Stampin' Up demonstrator friend Kathy made my day when she gave me this new set of tea-themed stamps and dies that aren't even out yet (they come out this week, I believe). I went home and started using them immediately, and when I get some new ink pads, I'll be trying even more designs. 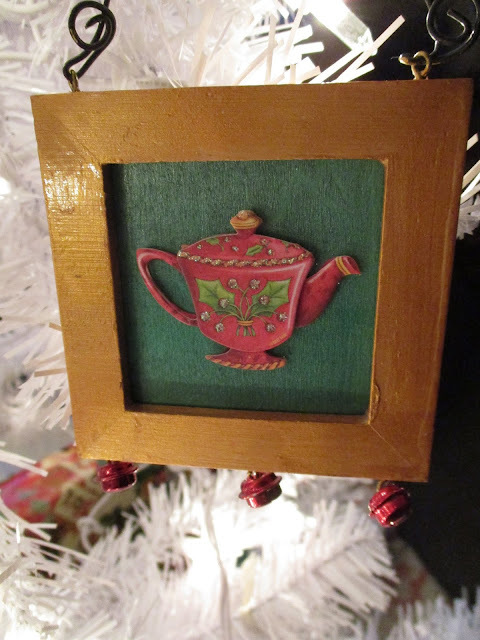 Did you receive any tea-themed Christmas gifts this year? I'd love to hear about them! "Callie was glad Leadenby had come in at that moment with the box containing the table runner. 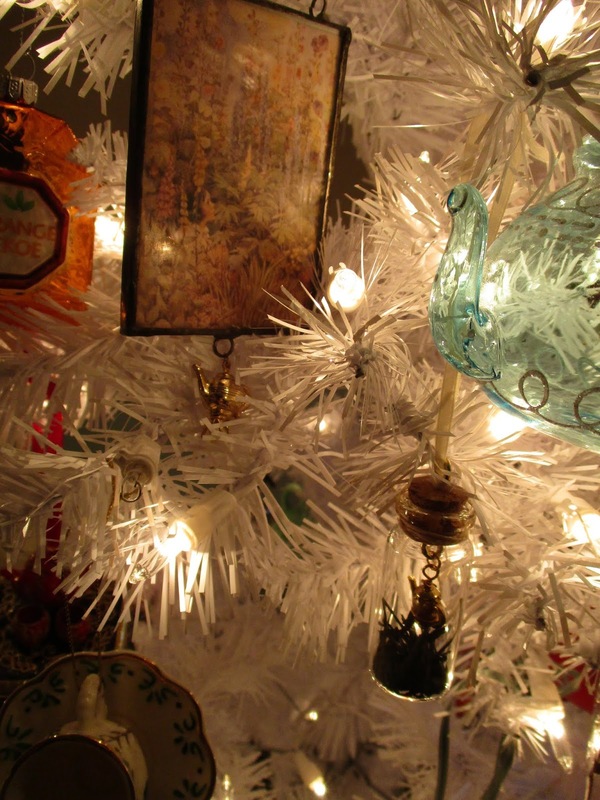 She spread it across the table's shiny surface and smoothed its lacy edges. It was a real vintage piece, like the china and the cutlery. 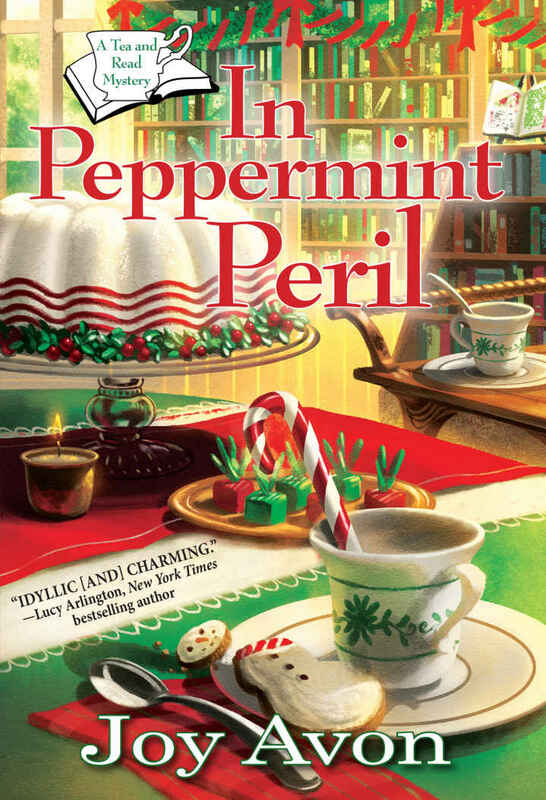 The tea party would have an Agatha Christie vibe …"
Tea lovers have a new tea-themed cozy mystery series to enjoy thanks to Joy Avon, who kicks off her Book Tea Shop Mystery series with a delightful Christmas-themed book, In Peppermint Peril. Callie Aspen has a great career as a tour guide who leads trips to historic venues all over the world. She returns home to Heart's Harbor, Maine, intending merely to celebrate the holidays with her great-aunt, Iphigeneia, who runs Book Tea, a tea business offering book-themed teas. Callie is quickly enlisted to help her aunt set up for a pre-Christmas tea party at Haywood Hall, a historic home whose elderly resident is expected to make an important announcement about her will. At the same event, Callie's old friend Sheila hijacks the tea and uses it as an opportunity to have her daughter's engagement announced, and the carefully laid plans for the tea soon go off the rails. When the engagement ring goes missing—and missing from a hiding place readers will particularly enjoy—it complicates the event, and so does the dead body found in the home's conservatory. 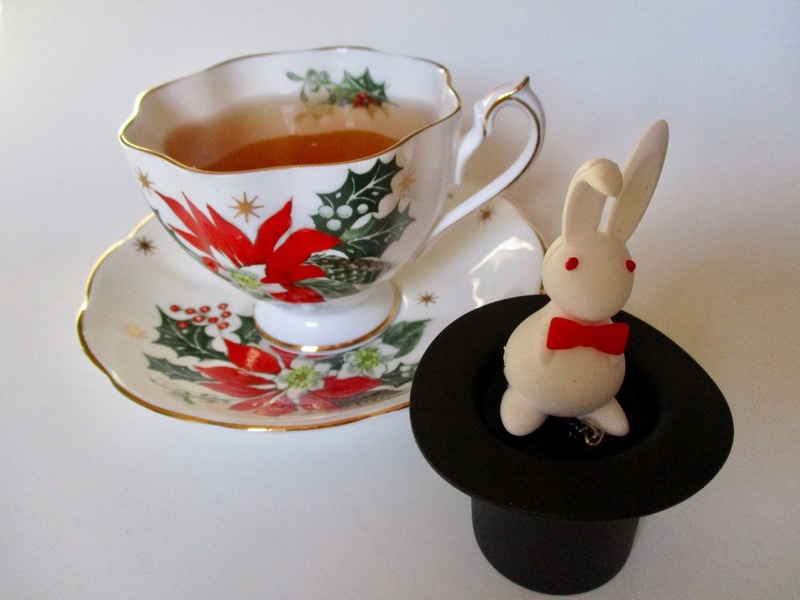 While the many tea elements of the story will immediately appeal to tea lovers, the mystery itself is fun to solve, as there are so many terrific suspects who might have had it in for the deceased. And Callie Aspen is a character it's easy to root for, so readers will hope to see Callie and her sweet Boston terrier, Daisy, making a permanent home in Heart's Harbor. This book was a well-written, holiday-perfect launch to the series, and I look forward to reading the next installment. "The rest of the day, Jenny felt strangely languid, like she was swimming underwater. 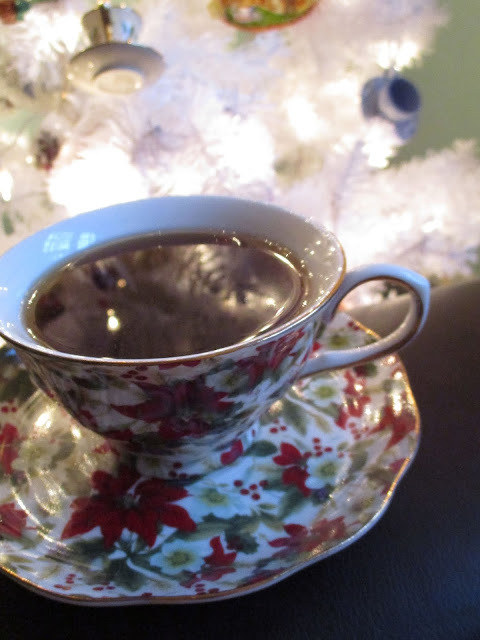 She drank peppermint tea, nibbled chocolates and took the boys on meandering walks. Though the day was as gorgeous as fall got in North Carolina, with red and magenta leaves on the trees and the sky a blue only seen in Monet paintings, Jenny barely noticed …"
This book is actually one chosen as this month's selection for a book club I'm in with some local friends. I immediately loved the cover since I have a real hankering for a vintage camper of my own, and I was also intrigued to learn that author Susan Schild "writes heartwarming, feel-good Southern novels of love and family featuring women over forty bouncing back from trouble, having adventures, and finding their happily ever afters." A great idea! 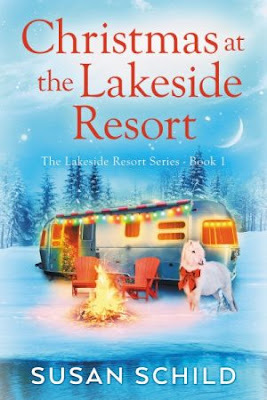 This book was a romance and not my usual cozy mystery, but if there is such a thing as a cozy romance, this would be it. Jenny Beckett is a down-on-her-luck forty-two-year-old tutor whose fiancé fell in love with his physical therapist and canceled his and Jenny's plans for a Christmas wedding. As a result, Jenny is not in much of a fa-la-la mindset. To add insult to injury, she learns the property where she rents a small cottage is being sold and so she needs to move, pronto. Then Jenny gets a phone call from a law firm, the caller saying he has some news regarding Jenny's no-account father, whom she hasn't heard from in ages. It turns out that Jenny's father, Jax, has died of a heart attack, and despite her assumption that he died penniless and she's being called about his debts, he actually owned a house as well as some unfinished cabins on valuable lakefront property there in North Carolina. With hope on the horizon, Jenny leaves her tutoring job, moves into one of her father's cabins—where she begins to reconsider her assumptions about her late father—and begins to build a new life for herself. Through a chance encounter at her neighborhood hardware store, Jenny meets a local man, Luke, who agrees to serve as her contractor and help her finish the cabins, and his sister, Alice, helps as well. Jenny succeeds in getting a loan for the new construction on the cabins, but she's quickly burning through the money as the cabins take shape. Even Luke refuses to promise her they'll be completed by the middle of December, when she needs to see some money rolling in from reservations. And although Jenny has sworn off men and vows not to get involved with another one, she can't seem to help falling for Luke. As the cabins near completion, she realizes she's going to miss this kind, handsome man she's gotten to know so well. Schild has crafted a lovely and hope-filled holiday romance, and her well-drawn characters in a sparkling setting will make readers want to plan a follow-up visit to the Lakeside Resort. "Business at the Hearth was out of control all afternoon. 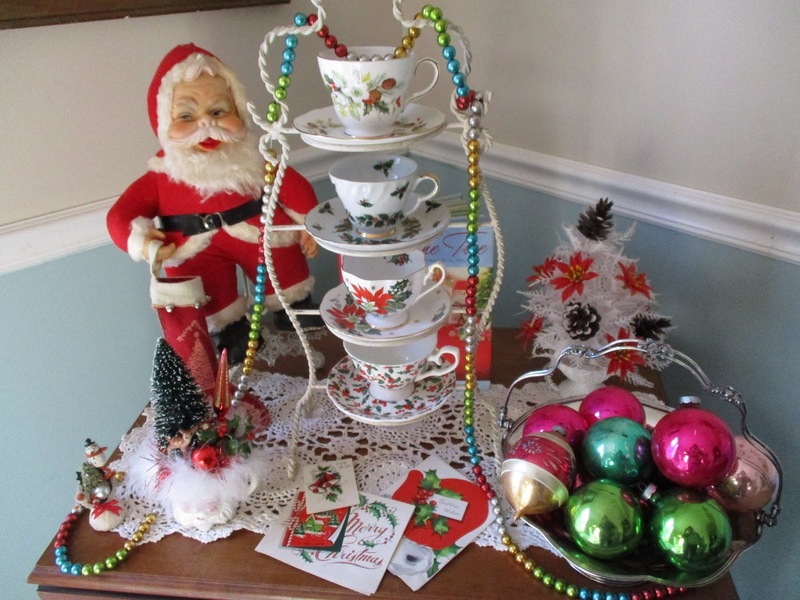 I spun through the tables like a lunatic delivering Santa's cinnamon tea, every kind of cocoa under the sun, and a rainbow of cookies in every shape and size." 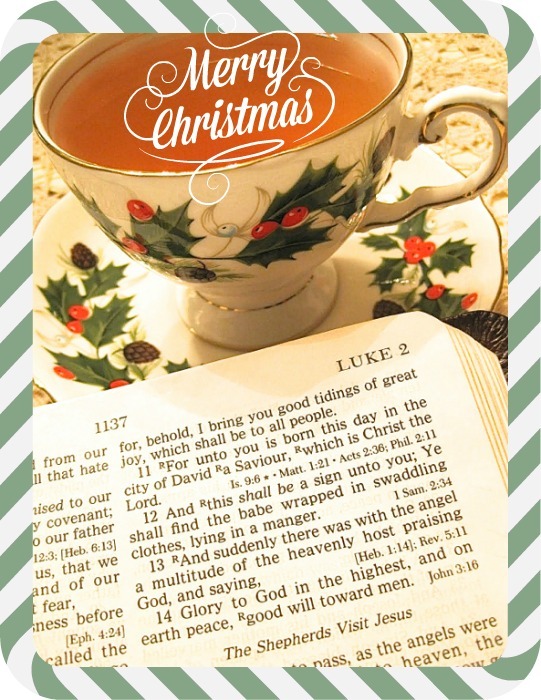 Since it's Christmas week, I thought I would do something different and share some of the Christmas-themed novels I have been reading in the weeks leading up to Christmas. 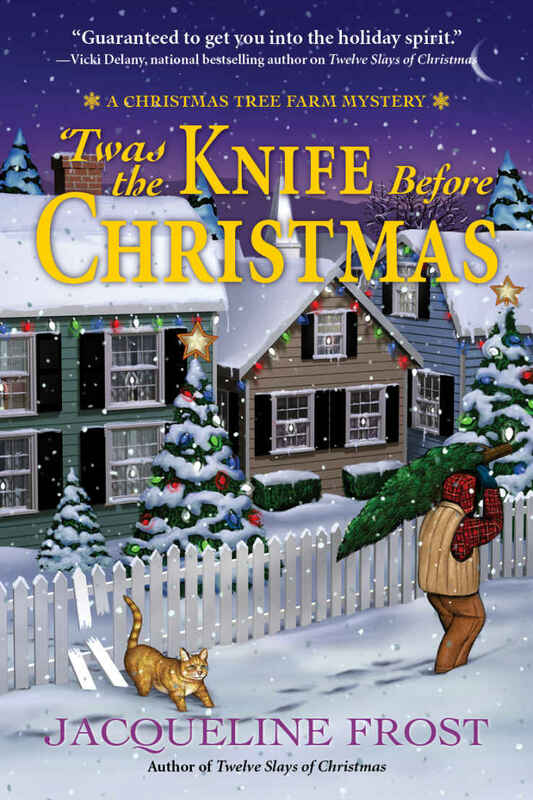 While 'Twas the Knife Before Christmas by Jacqueline Frost may sound sinister, it's actually among the coziest of cozy mysteries, and when you finish this book, you'll be ready to book a trip to Mistletoe, Maine. That's the home of Holly White, whose family owns and operates a Christmas tree farm known as Reindeer Games. Holly's best friend, Caroline, has just opened a new cupcake shop in town, and Caroline is still hopping mad after a bad date with a guy named Derek, whose less-than-gentlemanly ways caused her to tell him off and leave. The date occurred at a local benefit dinner, and to Caroline's dismay, their fight was recorded and broadcast on the news. 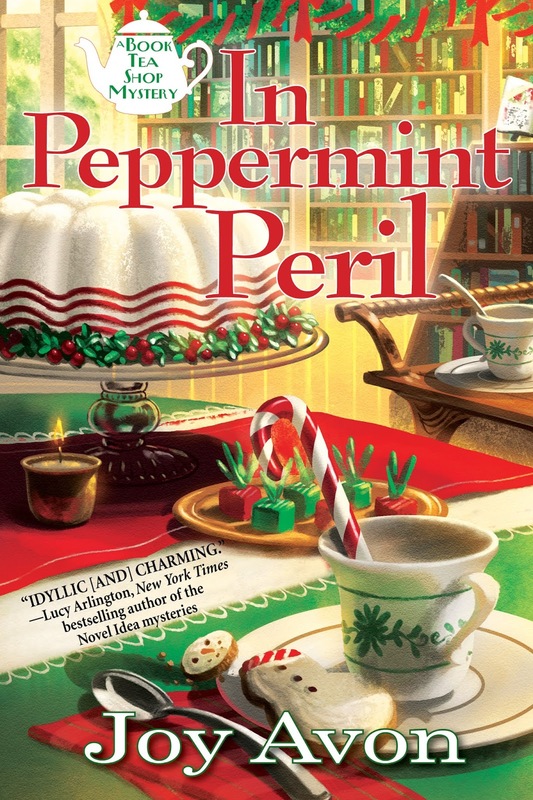 Caroline tries to put the unfortunate evening behind her, but that's hard to do when she and Holly show up for the town's tree-lighting ceremony and a giant candy dish full of peppermints is revealed—with Derek's lifeless body inside. Caroline is arrested for the murder, and Holly and her friends pester Evan, the sheriff—who also happens to be Holly's love interest—about getting Caroline out of jail. In addition to worrying about her imprisoned girlfriend, Holly is concerned that Evan has become standoffish and refuses to tell her why he's been going on so many out-of-town trips. To make matters worse, Holly is checking out his house one night while he's away and spots an attractive female inside. As if all that isn't enough to keep her busy, Holly is also helping her parents as work nears completion on the new inn at Reindeer Games, where Holly is about to become the innkeeper. 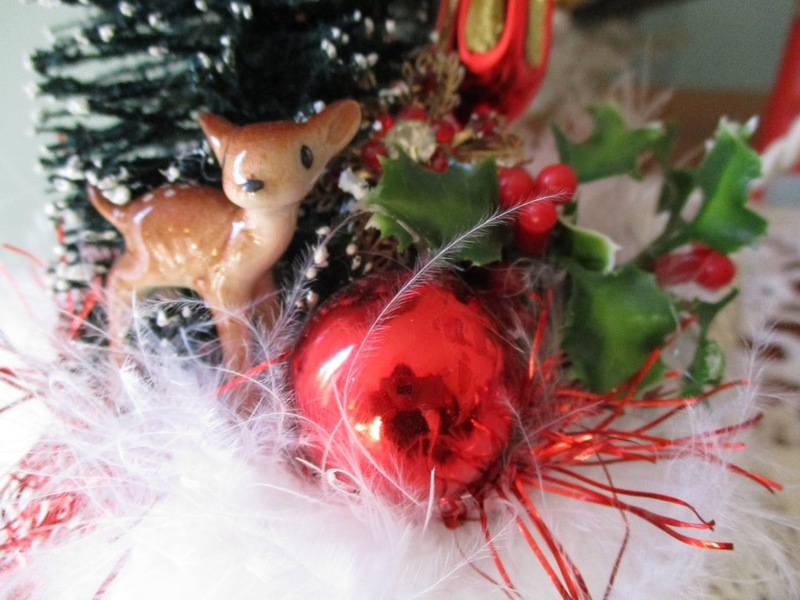 This murder mystery is a good whodunit, but the star of this show is the setting of Mistletoe and particularly the delightful Reindeer Games. 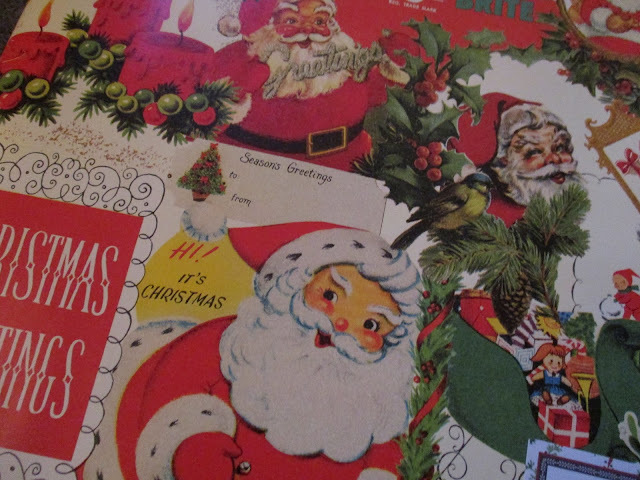 Whether it's sleigh rides through the snow or the cleverly named "Bling that Gingerbread" contest, Reindeer Games has got it going on during Christmas, and Santas galore are popping up all over town. 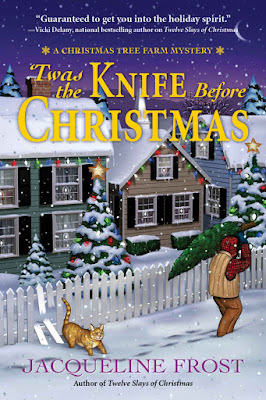 There are so many cute references to Christmas in this book—from Holly and the town of Mistletoe to an almost magical contractor named Christopher—that only the most Scrooge-like of readers won't find something to love in this charming, exceptionally well-written holiday tale. Erin S.! And I've just sent Erin an email, so hopefully I'll hear from her shortly and can get these headed her way in time for Christmas. 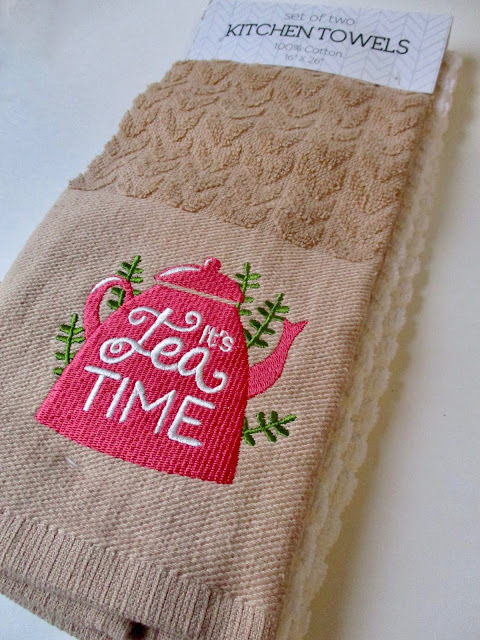 So a friend of mine has gotten me hooked on some of her crafting videos on YouTube, and in the course of exploring more videos on YouTube, I found this Tea Time Jazz station that is quite lovely! Yesterday, as I was wrapping gifts and taking care of a few more last-minute things on my Christmas list, I kept stopping to look up videos to play in the background while I worked in the dining room, but I'm going to check out more of this Tea Time Jazz and add it to my rotation as well. If you need some relaxing music (in addition to all the Christmas music), you too may want to check this out! Cooking and baking and holiday making! 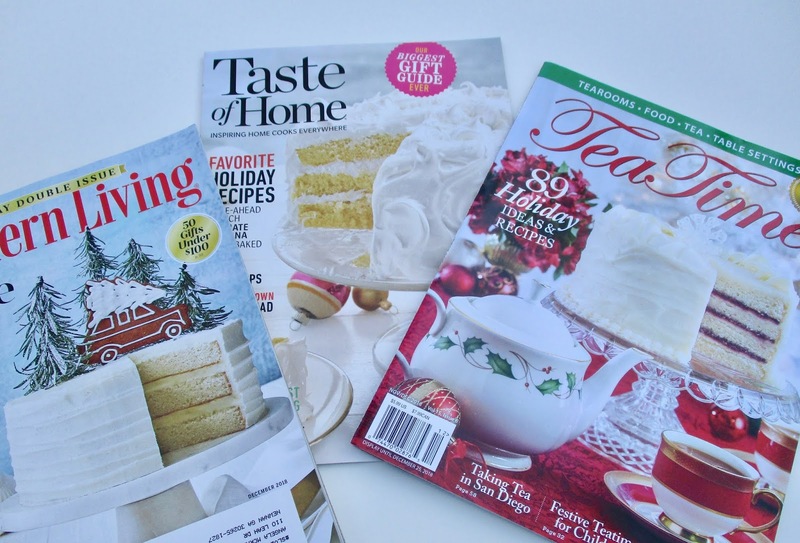 Have you noticed all the white cakes on magazine covers this month? Southern Living always has what they jokingly refer to as the Big White Cake on the cover of their Christmas issue, but Taste of Home and Tea Time have followed suit this year with their own white cakes. 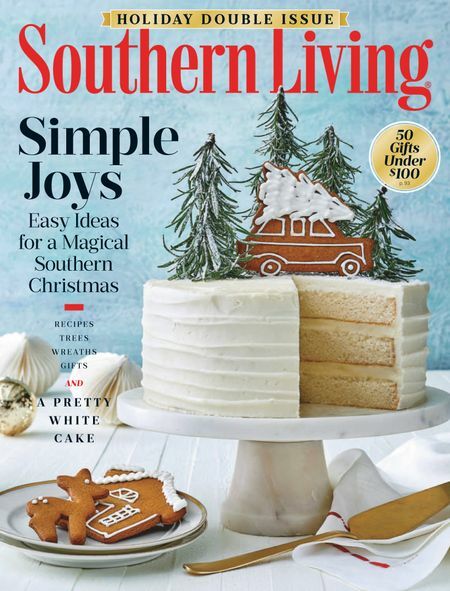 Southern Living's cake comes with a bit of a twist this year. The recipe for the cover cake is included in the magazine, but so is a variation on the cake from Publix. 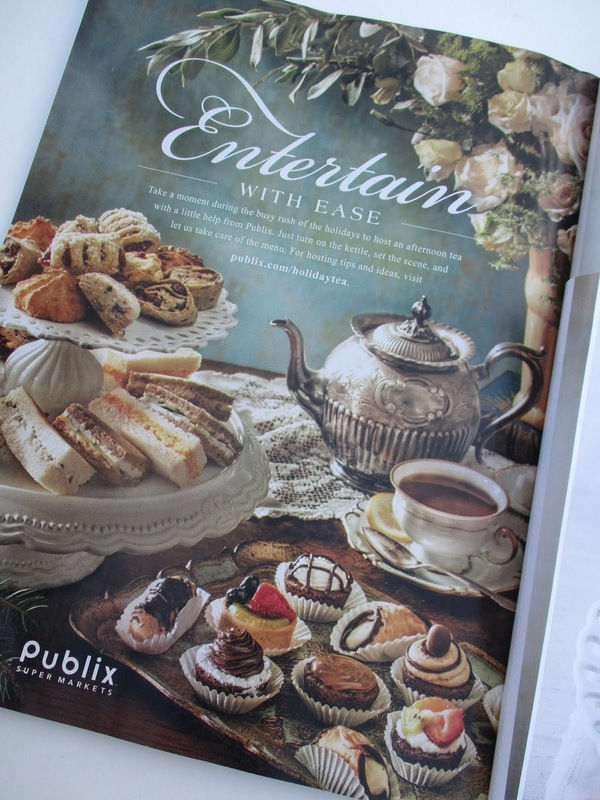 And Publix has an ad in the new Southern Living that is simply one of the prettiest teatime images I've seen all year. Isn't this gorgeous? It caught my eye immediately as I flipped through the magazine. I note with interest that the ad says, "For tasting tips and ideas, visit publix.com/holiday tea." Click there now if you want to see another version of this lovely photo. 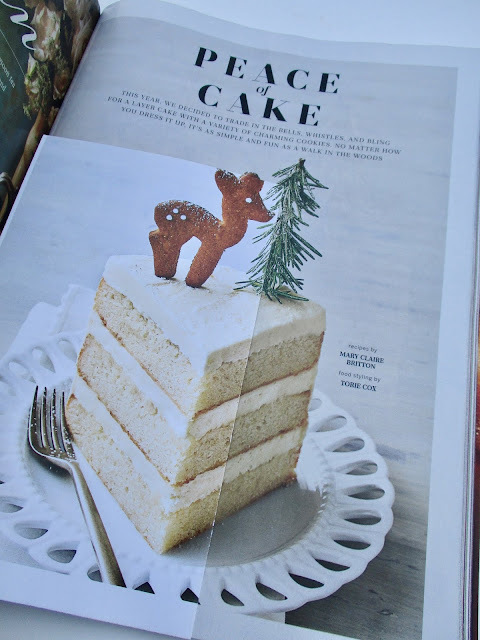 So this year, Publix has partnered with Southern Living and included in the December issue this little foldout leaflet, which has the recipe for a variation on the Big White Cake, an organic option with cranberry filling. 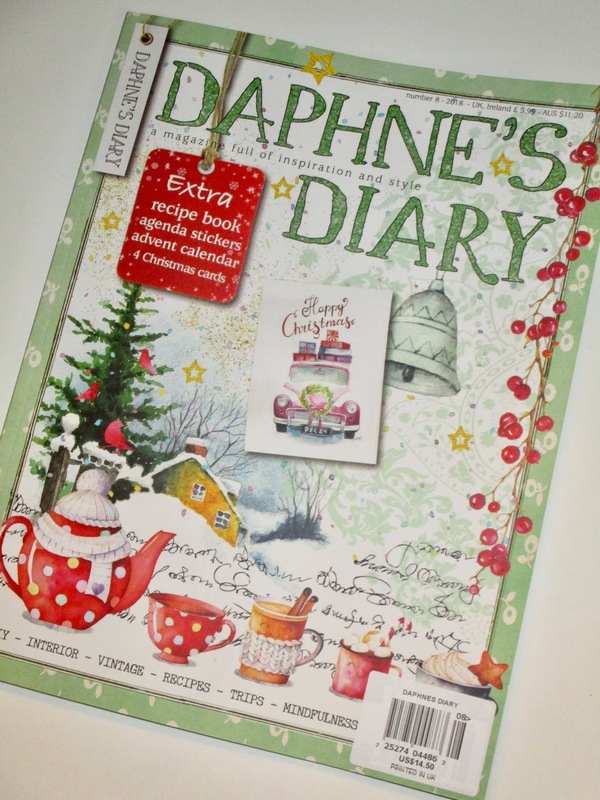 There's also a gluten-free option, which is available online here along with the organic cake recipe. 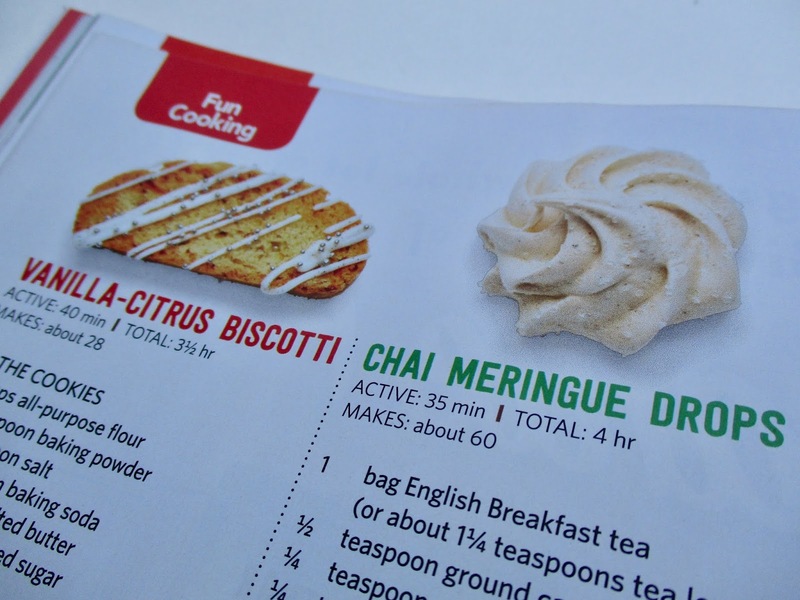 And lest you think I'm only promoting Southern Living, I'm stepping outside the South to let you know that the December issue of Food Network Magazine hasn't forgotten tea lovers either. Or Chai Meringue Drops, perhaps? 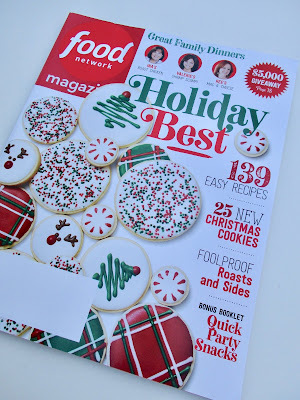 I'm going to be doing plenty of Christmas baking in the days ahead, and it's so nice to have so many great new recipes to try. Have you tried any of these yet? 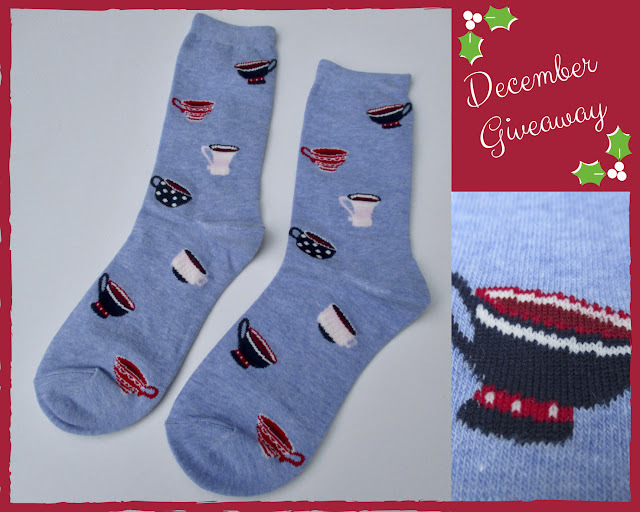 December Giveaway: Teacup Socks from the Lovely People of Talbots! Last month's giveaway of the teacup trouser socks from Talbots proved so popular that I am happy to announce I'm giving away another pair of the socks (my last!) for this month's giveaway. And the story of how this came to be is rather fun. 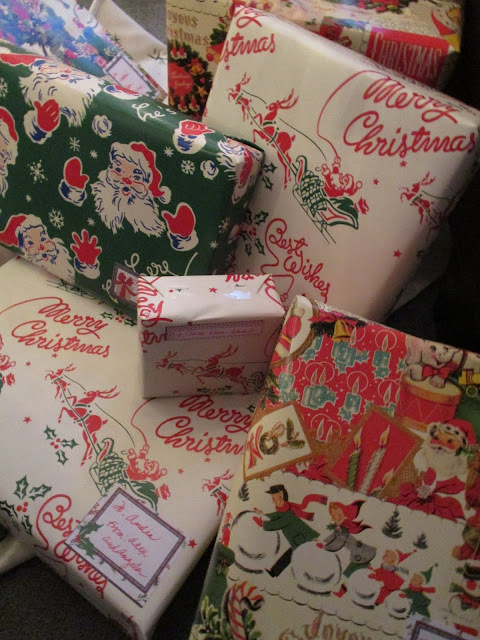 Back in October, I bought two pair of the socks, one for me and one for the November giveaway, and the winner was tea blogger Marilyn. End of story, or so I thought. A few weeks ago, I got a fairly desperate-sounding email from a young man who looked up tea-themed socks online, saw these on my blog, and wanted to surprise his fiancee with a pair for Christmas—a pair she would wear in their wedding. He tried to order them from Talbots online, but the socks were sold out. He wrote me asking if I might possibly know how to get another pair. Alas, I did not (and mine had already been worn and laundered or I would have gladly donated those). So I wrote to the Talbots media office, explained the situation, and told the prospective bridegroom that I hoped they might be able to help him. Before a day had passed, the lovely folks at Talbots had located a pair of the sold-out socks and wanted to send them to the groom, free of charge. I wrote to the groom and told him I'd found the socks, and I also mentioned that it would sure be fun to thank Talbots by sharing online a picture from the wedding day with the bride in her Talbots teacup socks. Surprisingly, I didn't hear right back from the fellow, but it turns out, he was diligently searching Talbots stores on his own, found one pair of the socks, and even sent me a photo of the giftwrapped socks and thanked me for offering to help locate them. So, a happy ending! But then when I wrote the lovely people of Talbots to explain that the socks were no longer needed, I was told that they wanted to send them to *me* anyway! Now isn't that just an above-and-beyond-the-call-of-duty level of customer service? And since I already have a pair of the charming (and apparently coveted) socks, I am giving away this final pair as a Christmas treat to one lucky winner, all thanks to the generosity of Talbots—and the diligence of a young man who really, really wants to make his bride happy. So if you'd like to win these treasured socks, simply leave an "Enter me" to this post between now and 7 a.m. EST on Friday, December 21, making sure to include an email address so I can contact you if you're the winner, and you'll be entered to win. US only, please. Good luck! 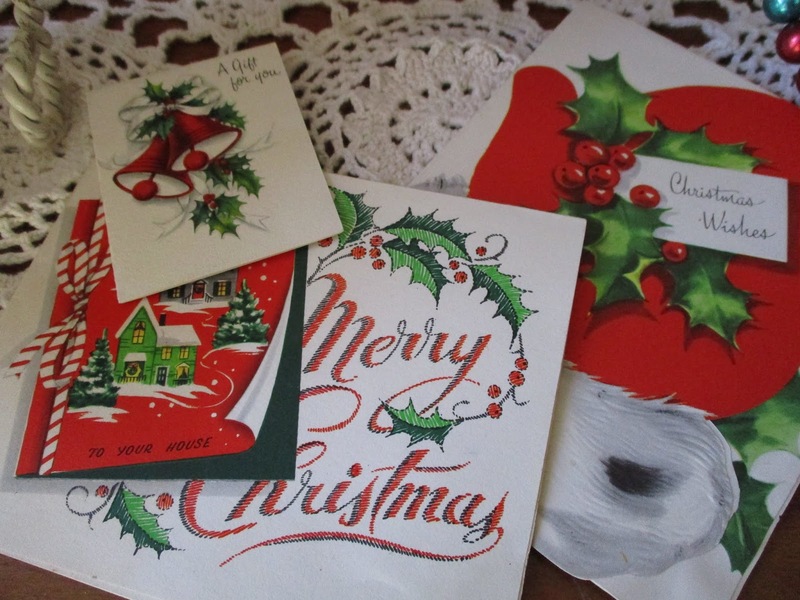 Vintage Christmas cards and postcards with a tea theme do not appear to be that plentiful, but this week, I found a new-to-me vintage postcard on Flickr that we are free to use with a link to Dave here. Isn't this a sweet image? 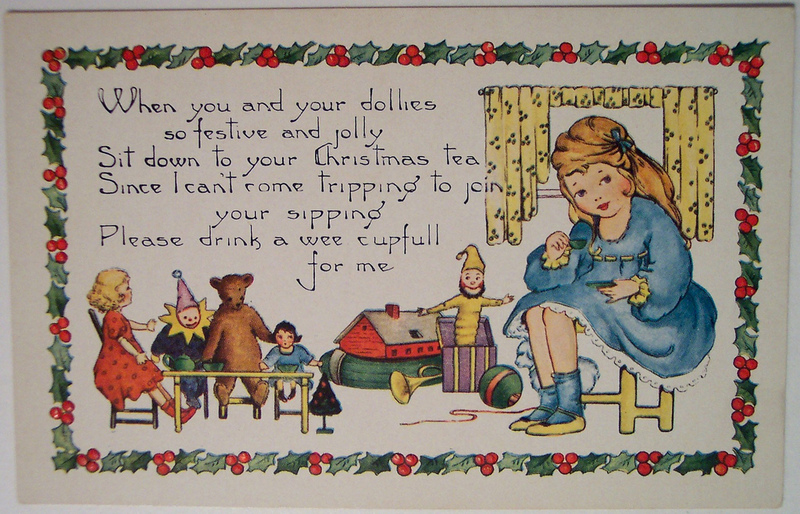 I love that line about "you and your dollies so festive and jolly," and I don't hear that much about dolls anymore. Do you? 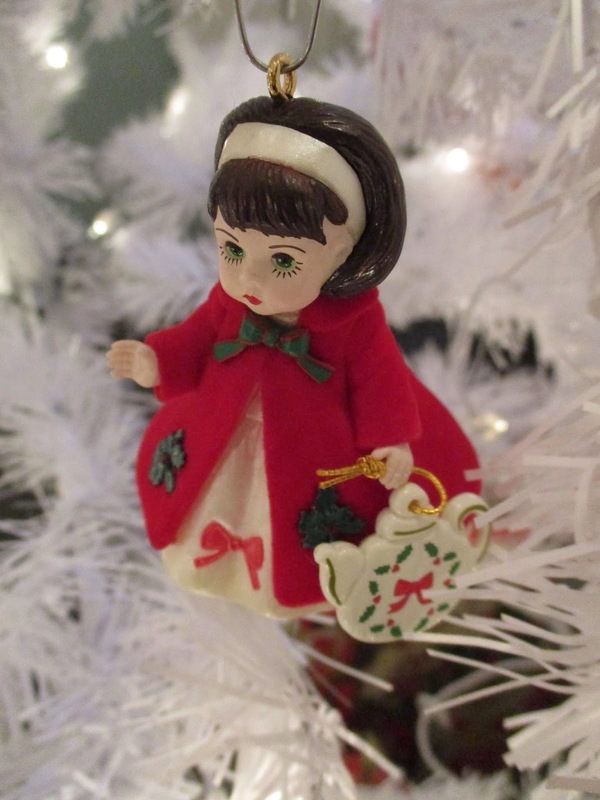 When I was a little girl, Santa used to bring me those fancy dolls that were really for display, usually in a velvet or lace dress and with perfectly coiffed hair protected by a nearly invisible hair net. One doll I do remember playing with is Dancerina the ballerina. Do any of you remember your childhood dolls? I'd love to hear about them, especially if they joined you for tea! 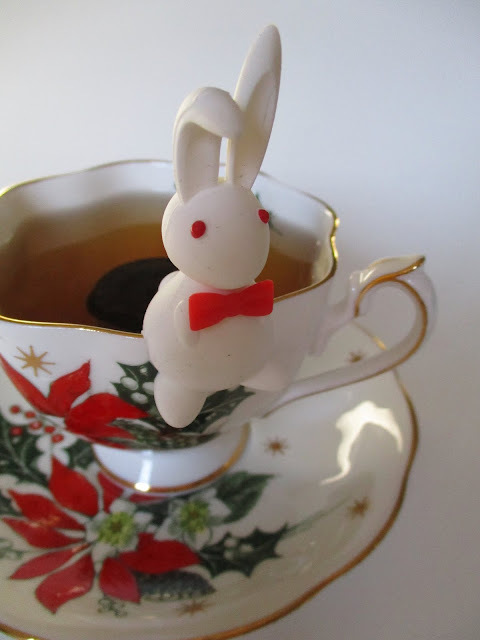 I received an early Christmas gift of a new tea infuser from my friend Nancy, and I'm nicknaming this one "Snow Bunny" since I am hoping to see snow here in Georgia sometime this winter. 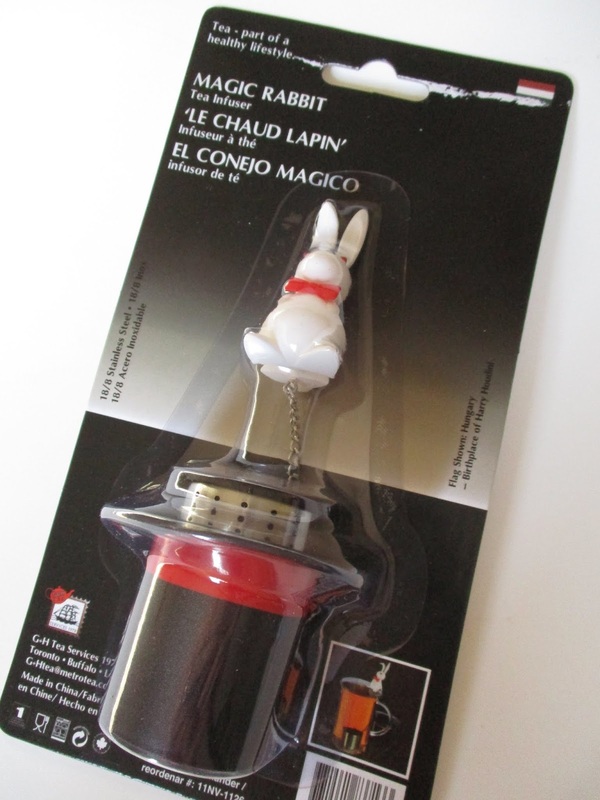 It's actually a Magic Rabbit Tea Infuser, and it's quite simple to use. You fill the infuser, a typical tea ball, and the bunny attached to it perches on the side of your cup while the tea steeps. And when you're done, the infuser "magically" goes back in the hat while the bunny is there to greet you! 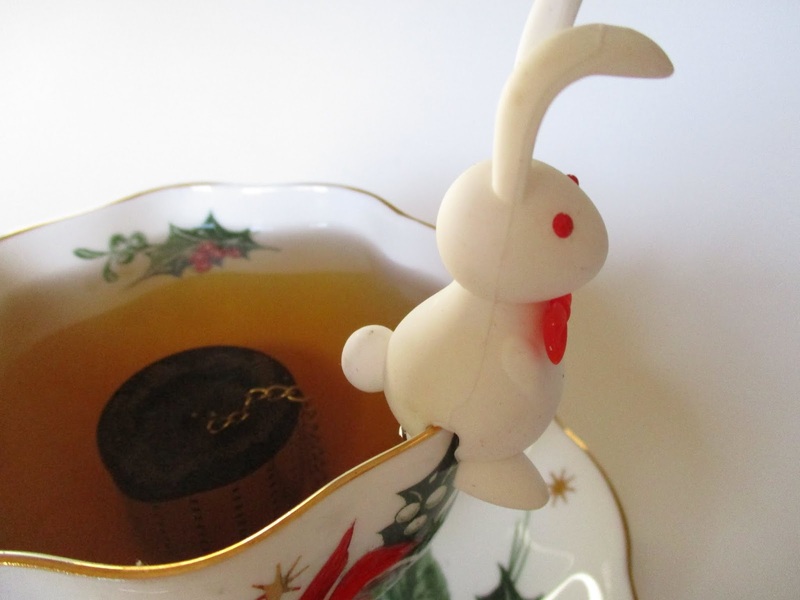 Now I don't always use my cute tea infusers (I tend to reach for a mesh strainer or filter tea bag), but I do love to collect unusual tea infusers as fun teatime novelties. It has dawned on me that I need a clever way of displaying them. Any ideas? Earlier this year, my friend Carole Ann gave me a couple of these tipping teapot ornaments that appear to be magically pouring tea, and I am so happy to have them on my tree this year. In fact, as I was putting up the tree last weekend, it dawned on me that this tree is rich in memories and friendship, and that's probably why I enjoy it so much. 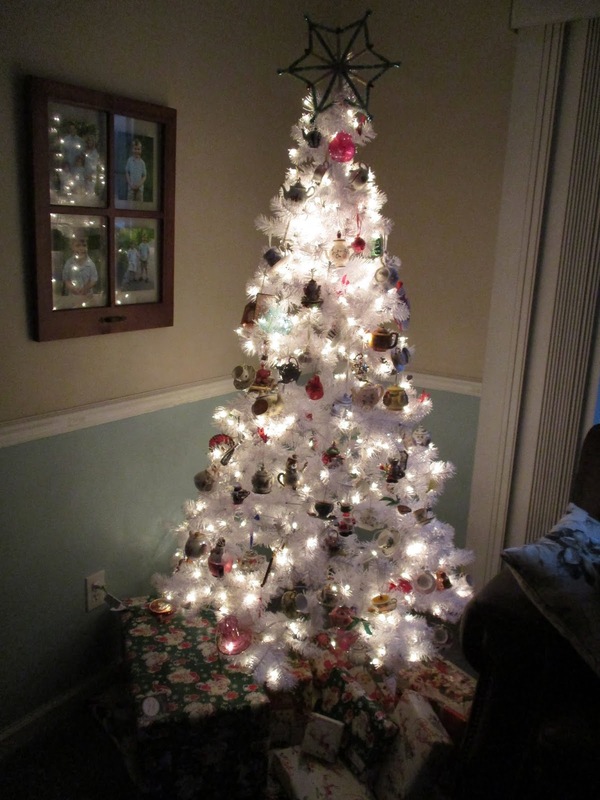 The smallish (six-foot) white tree I bought last year was a hit with my husband, so I decided to decorate the same tree again this year. Two of my most treasured ornaments: tea-themed ornaments lovingly handmade and gifted to me by thoughtful friends. Tiny gold charms are on both and always make me smile when I pull them out! A souvenir of a long-past December trip with Alex. 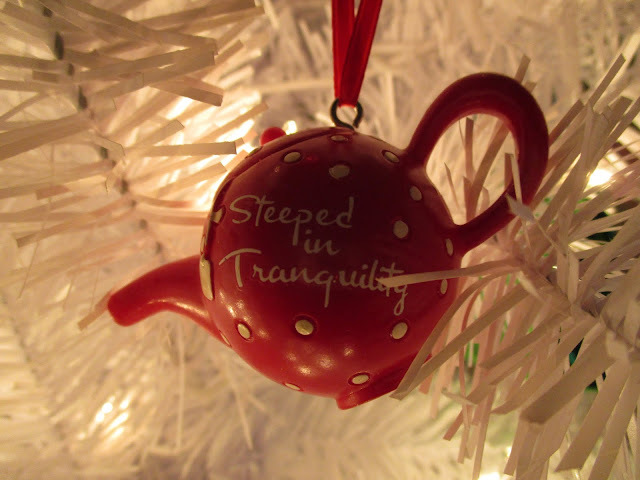 Another treasured gift from a friend, which I take as a reminder that I, too, am to be "steeped in tranquility" at Christmas, not running around like a chicken with my head cut off. 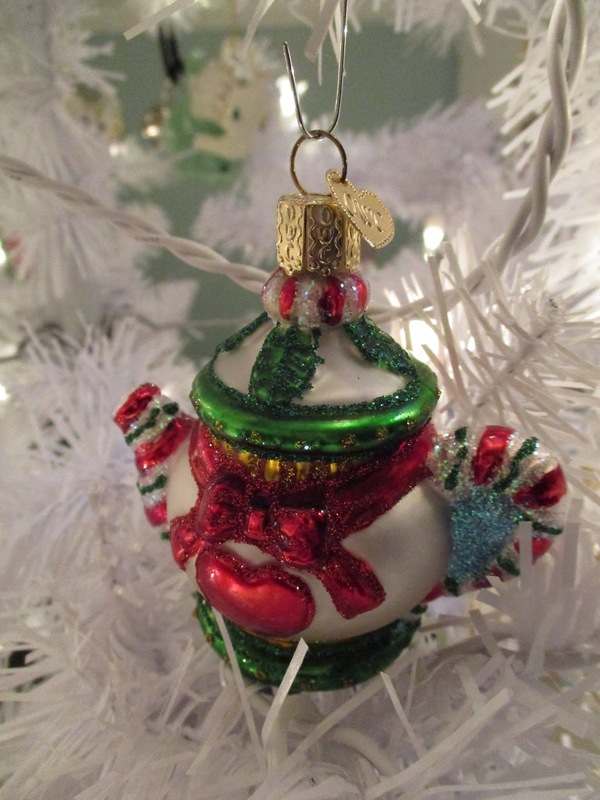 Another treasured handmade ornament, this one from Texas! A tea-loving Madame Alexander doll who came to me from Hawaii. Together, they all make me so, so happy! Note how the gift wrap has a To/From label printed as part of the design (see center of photo). Well, last year I decided I would just write on the paper instead of applying labels. 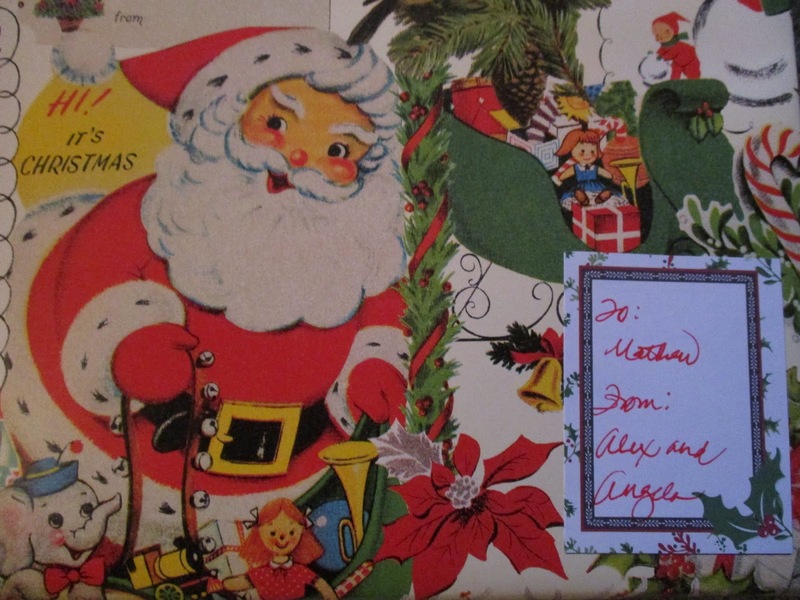 But no one in my family (except me) knew to look for the handwriting, so it probably took us thirty extra minutes on Christmas Day to hand out all the presents since everyone was trying to figure out whose package was whose! So it's back to labels this year. And of course I don't have to tell you, dear reader, how I reward myself following an afternoon of wrapping gifts! "The Southern Living Party Cookbook: A Modern Guide to Gathering"
In my early twenties, I was introduced to Southern Living magazine, and I've been reading it pretty steadily ever since. 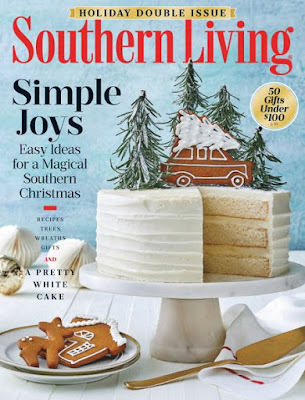 Southern Living is always a source of high-quality home and garden articles, excellent photography, and delicious recipes, and they currently feature a monthly column by one of the South's greatest writers, the incomparable Rick Bragg. 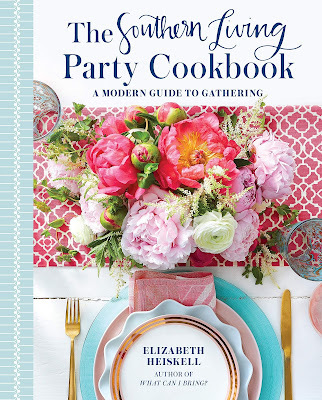 So I was delighted to have the opportunity to review a new cookbook from this magazine, The Southern Living Party Cookbook by Elizabeth Heiskell. The original Southern Living Party Cookbook came out in 1972, and this new edition, subtitled "A Modern Guide to Gathering," is a beautiful book that's just brimming with recipes begging to be tried. The book also includes a brief "Hosting Handbook," which would make this book a great wedding gift for a new bride setting up her home. The book is divided into sections titled Teas, Coffees, and Receptions; Brunches and Lunches; Come by For a Drink Y'all; Cookouts; and Celebrations and Dinners. As a tea lover, I especially enjoyed the first two chapters and found plenty of goodies I want to make, including the Puff Pastry Chicken Salad Ring, Lemon Drop Cookies (they're made with crushed lemon candies), and the Quick Petits Fours. 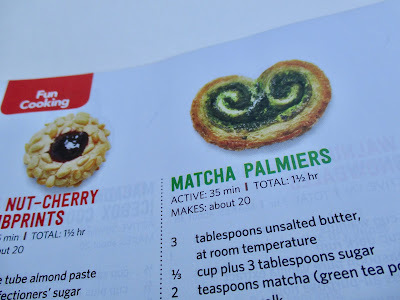 There are also several tea sandwich recipes I'd like to try, including the Salmon-Cucumber ones, and something that sounds like a real possibility for teatime, the Cream Cheese-and-Pecan Rolled Grapes (with bacon!). And since I've never had a Southern Living recipe fail on me, I'm most eager to give these new ones a try. Now if Southern Living would just shoot for an entire book of teatime recipes, I'd be in heaven! 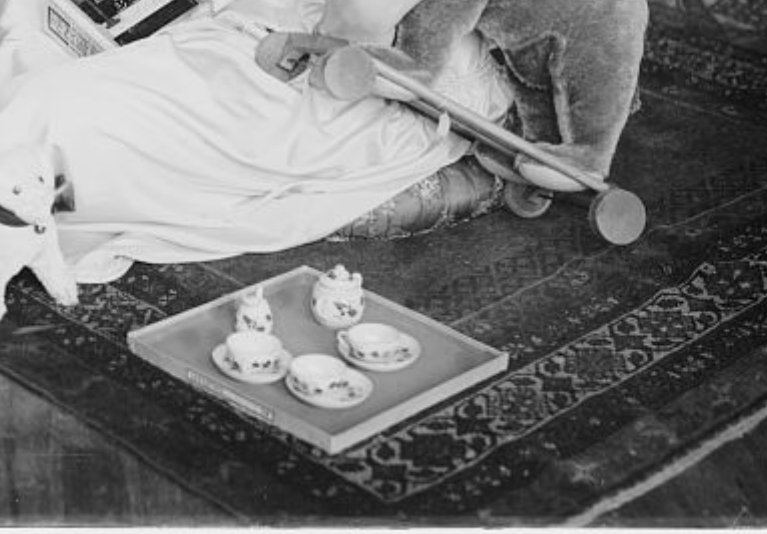 I enlarged a section of the photo showing the tea set to get a little more detail, but it's blurry, so I can't quite tell what the design is. If you happen to recognize the pattern, please chime in! So … Alma Gluck. I Googled her, and while I'd never heard of Alma, I certainly have heard of her son and her granddaughter. (I loved Remington Steele!) Who knew? Like many of you, I imagine, I now have so many Christmas decorations that I could decorate my house several times over. 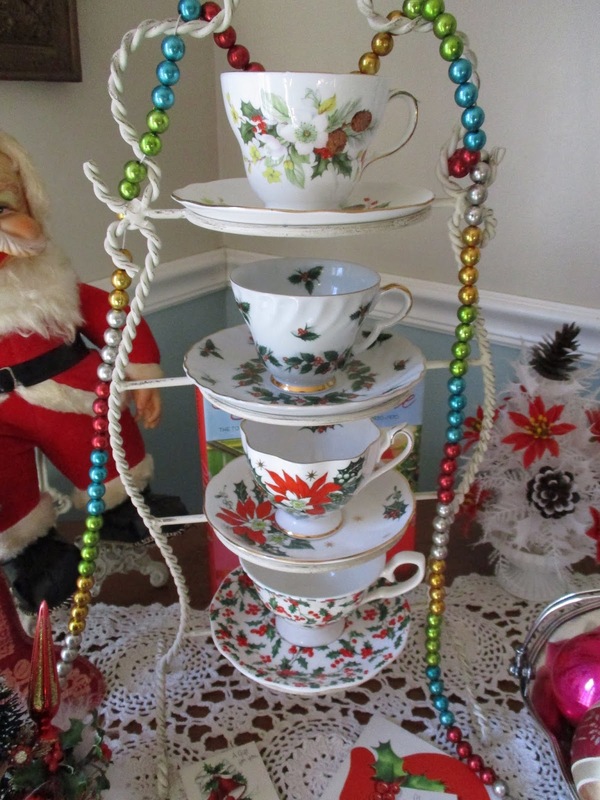 This year, I have developed a real hankering for the retro colors and designs from the fifties and sixties, so that's what I used to surround some of my Christmas teacups on the tea trolley this year. 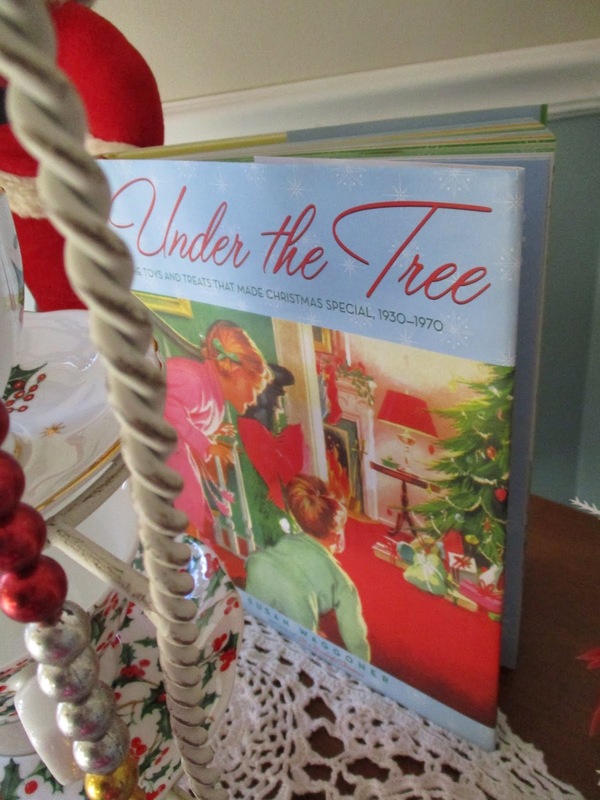 For those of you who, like me, were born between 1930 and 1970 (I was born the last year of the Baby Boom, 1964), I highly recommend this book, Under the Tree, which shows the dolls, trains, games, and other toys that were so popular during these years. I shared it with my husband for the first time recently, and he spotted an erector set just like the one he got as a child. I love pulling out my Christmas teacups each year, and it's almost like discovering a new gift when I reach into the box and find poinsettias and holly gracing some bone china cups and saucers. And I will indeed use them all during the month of December. It makes sipping so much more festive! Another fun antique mall find this year was this Rushton Santa Claus doll. I loved his vintage look and thought he'd be fun to decorate with. As I was paying for him, a man came up and told me he believed this doll was from the thirties. 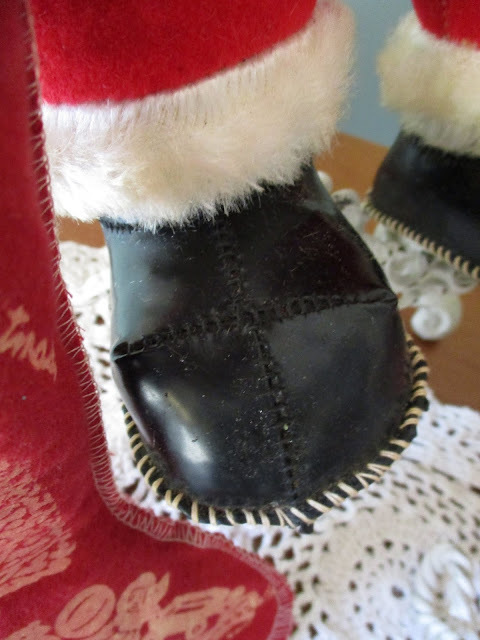 Santa's shoes looked pretty old, so I thought, "Hmm. Maybe." 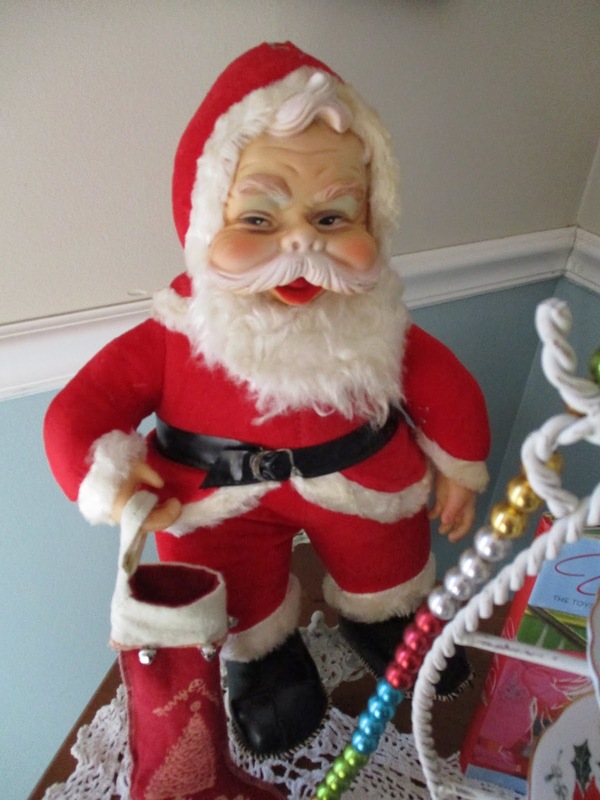 But then I got home, did a little research, and discovered Santa is actually a doll produced by Coca-Cola in the fifties (if you look at his left hand in the photo, he is missing the Coke bottle), and it sold for $3. Not surprising, really, that I'd find one of these in this area since I live near Coke's home office. 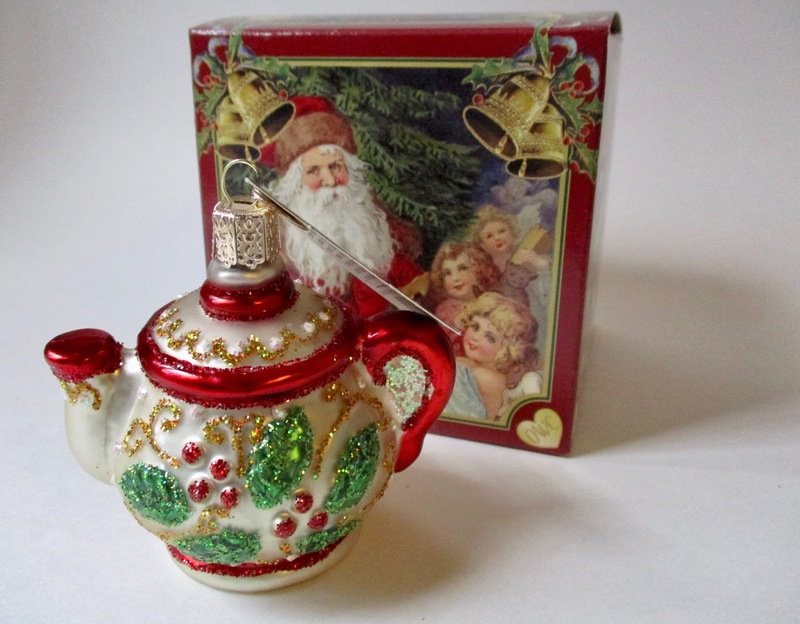 And this is the topper on the cute little Santa mug arrangement I got last month at that Christmas market. 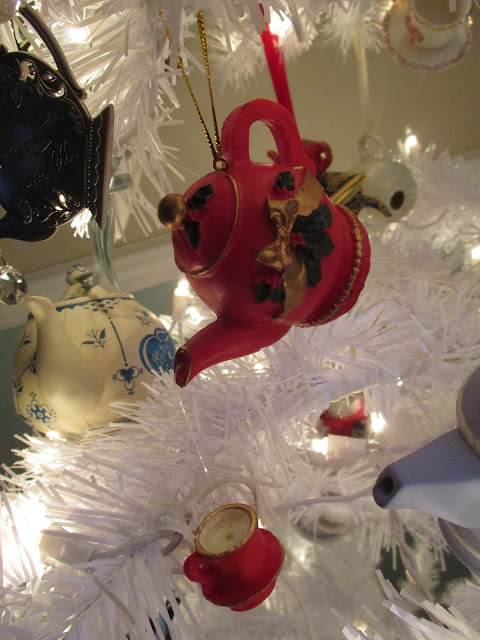 My tea-themed tree is up (I'm saving those photos for another day), and it's truly beginning to look a lot like Christmas around here! How about at your house? 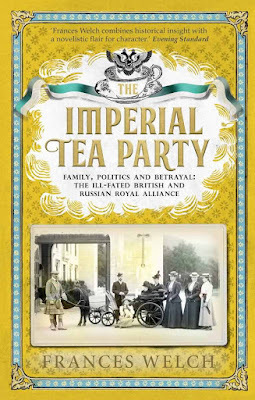 Summary: When Queen Victoria's favorite granddaughter, Alexandra, marries Nicholas II of Russia in 1894, Britain and Russia begin an uneasy alliance, and Frances Welch's account of this "ill-fated British and Russian royal alliance" provides lots of first-person accounts of what the parties involved were thinking at the time. My thoughts: I like to read first-person accounts of historic events, so I particularly enjoyed the many diary entries surrounding the three meetings between the British and Russian royals during the reign of Nicholas II. 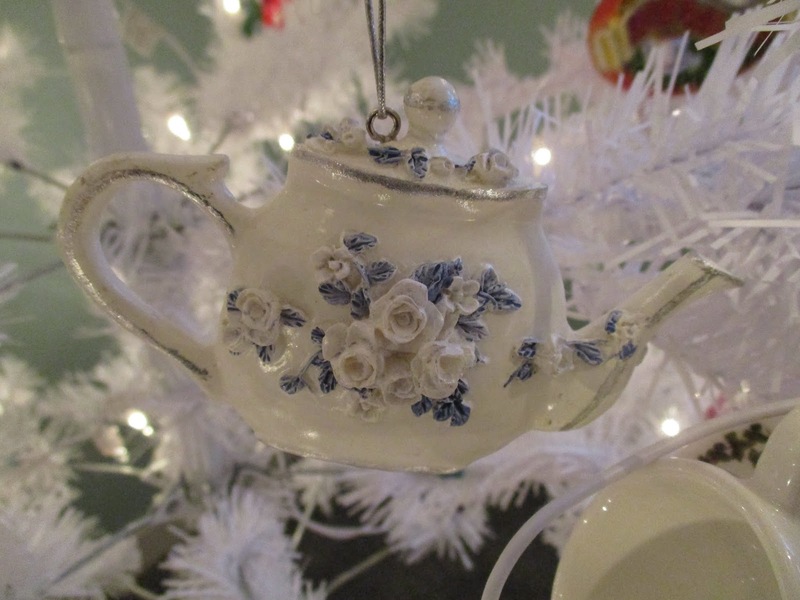 While tea was not the focus—and despite the book's clever title, I didn't expect it to be—I did find some intriguing bits about tea in the book. While "Alicky" and "Nicky" were engaged, "As they stopped for tea on a riverbank, Nicky proudly noted his future wife's unexpected catering skills: '[We] started to boil up some tea. Alix did all of this, since she has an excellent new "tea basket" from Granny.'" And on the way to one of the meetings after Queen Victoria's death, Queen Alexandra, the wife of Edward VII, was at sea on the Victoria and Albert when there was "a horrible knocking about in the North Sea," and the book says that "at one point, during a lavish tea, the Queen had been thrown across the room." She was thrown onto her back, according to one account, "followed by the tea urn, teapot, etc., all on her lap … it was a most unpleasant incident." 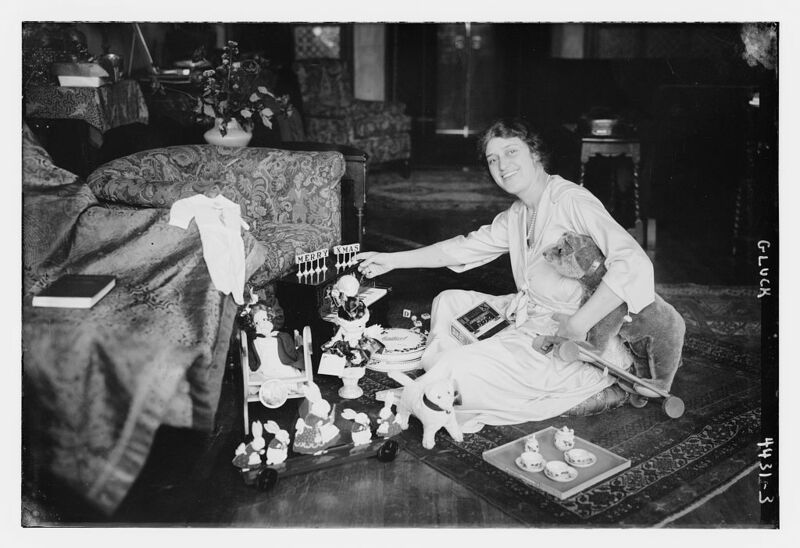 Queen Alexandra is said to have laughed off the incident and agreed to have tea brought to her elsewhere. I'd have probably called it a day at that point! Of course, the story of the Romanovs does not end well, since the tsar, tsarina, and all five of their children were later executed, and the book does a good job of explaining why the British had been hesitant to have the family seek asylum in England. The book also manages to humanize all of these royals, and here at the hundredth anniversary of the Romanov family's demise, it's a particularly fitting time to revisit their history. The book isn't light reading, but I learned a lot by reading it and even went online afterward to watch some documentaries about Tsar Nicholas and his family. On a lighter note, I'm looking forward to the December read, In Peppermint Peril, a cozy that's first in the new "Book Tea Shop Mystery" series from Joy Avon, and it's about a woman who organizes book-themed tea parties. What a fun idea for a series, and I do hope some of you will read along! 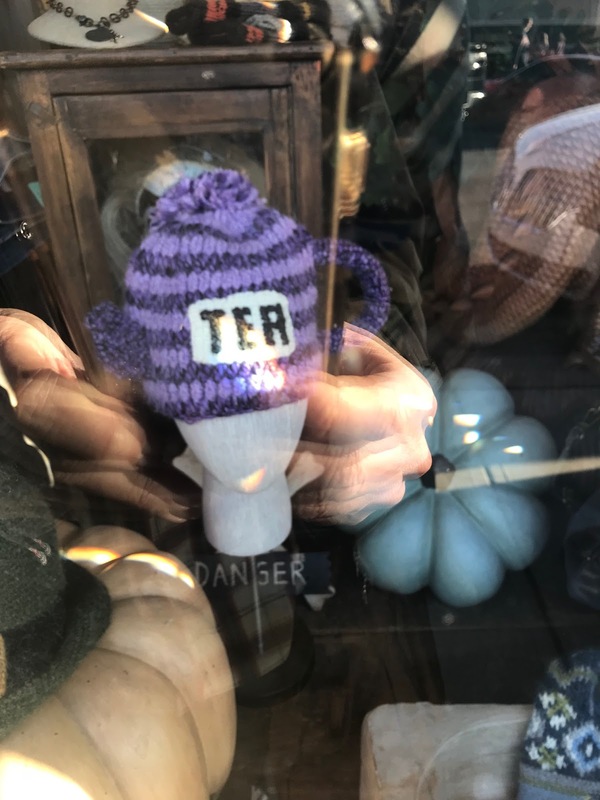 A few weeks ago, my sister was attending a retreat in the North Georgia Mountains with some friends from her church when she texted me a photo of a hat she saw in a shop there. "You should make this hat," she said. I agree. And I would wear it. In fact, I wish I'd had it yesterday on my 5 p.m. walk, when the temperature was in the low thirties with brisk winds. Despite wearing a thick winter coat and leather gloves, I nearly froze. So getting some sort of hat, and fast, is a must! I've been sewing hexies during my free time as I watch Netflix these days, but I may have to set those aside in favor of whipping up a new hat. I've found a crochet pattern for a similar hat here and a knit pattern for such a hat here. (There's also a pattern you can buy for a knit hat with a teapot design here, but this is way beyond my skill set as a knitter.) I believe I could crochet the hat on Ravelry.com pretty quickly, but alas, I've signed up for the site and clicked every button on that page and cannot find a way to download the pattern. Are any of you familiar with Ravelry and have any tips? Meanwhile, would you wear this hat? I sure would, around my neighborhood at least. 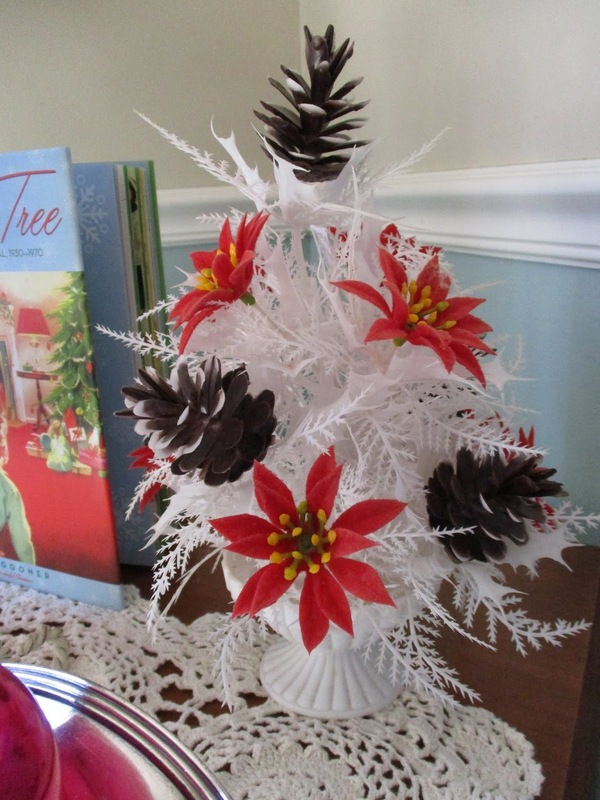 If you're a needlework fan, I'd love to hear what you're working on during these cool evenings! Because so many of you dear blog readers have encouraged me in my writing efforts over the years, I wanted you to be the first to see the "cover reveal" for my debut novel, Emeralds and Envy, a cozy mystery that will be published by Red Adept Publishing next year! 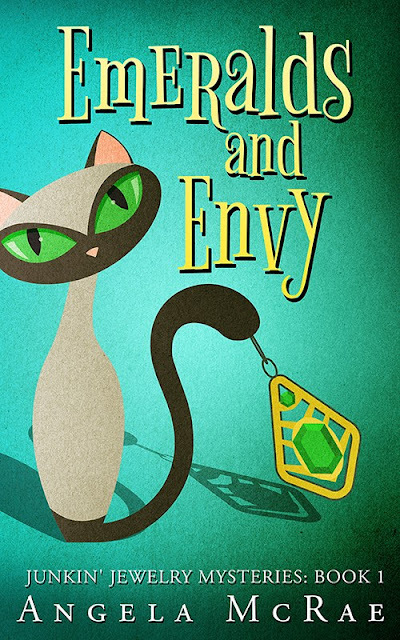 The book is about a small-town sleuth, Emma Madison, who is a former newspaper reporter turned jewelry designer. Emma loves to go junkin' for vintage jewelry (sound familiar? ), and she uses her jeweled finds to create new jewelry … when she's not busy solving crimes. You can read more about the book here. And you won't be surprised to learn there's a bit of tea in this book! There may come a day when I write a book that doesn't have a tea scene or two in it, but this is not it. I wish the book were already published so I could have it available for you on this Cyber Monday, but alas, I took my sweet time in writing and revising it. But I do hope you'll forgive my excitement in going ahead and sharing the cover. My understanding is that the publisher will release the ebook first and then the print book thereafter, and I do plan to order some print copies to sign for those of you who would like one. So please stay tuned because 2019 is going to be an exciting year!